Live comfortably with Solar Protection Screens. We offer top-of-the-line solar window screens, custommade for residences, businesses, apartments, condos, and mobile homes. Our energy-saving products will improve air-conditioning efficiency, cool your home by up to 15 degrees, and save you money. 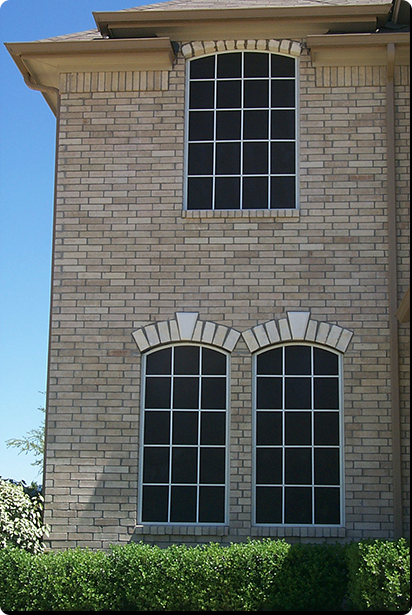 Solar window screens reduce the glare and heat absorption that frequently plagues Texas households. Even if you haven’t noticed it, heat entering through unshielded windows is making your air conditioner work overtime. Your energy bill will prove it. Solar Protection Screens will buffer your energy costs—but more than that, they are a brilliant investment for any homeowner. They pay for themselves many times over in cooling and heating costs alone—not to mention the federal energy tax credit you’ll become eligible for. With an average cost of $80.00 per window, the return on investment is realized every few years. With solar screens lasting around 15 years (variables permitting), it is not uncommon for the value to pay for itself four to five times before a replacement is needed. Solar Protection Screens is proud to offer the complete line of Phifer Products - Suntex, Super Solar and SheerWeave. These energy-saving screening products are designed to enhance and complement a variety of building facades. With several available colors and densities, these solar screens are a natural fit for your home or business. This green solar protection is the perfect low-cost home improvement solution you’ve been looking for. Contact Solar Protection Screens today for more information on how to better insulate your home and save on energy costs.